In MFL at Sea Mills we aim to ensure children’s interest and enjoyment in Modern Foreign Languages; to create an atmosphere where pupils wish to learn, so that they come to enjoy the subject, because they are active participants in it. This starts in our Early Years and Key Stage One classes with songs, games and short spoken activities. In Key Stage Two we enable each student to achieve his/her potential in a variety of situations, using all available resources appropriately, to ensure the highest level of achievement for each student. This starts in Year Three with learning the pronunciation of the Spanish alphabet and continues with a wide variety of practical speaking and listening activities. The progression of language skills continues throughout Key Stage Two with the focus of transferring spoken language skills into sentence level work. All students are given the opportunity to work independently and as part of a team in varied activities, contributing to the development of core skills such as I.T, speaking and listening, reading and eventually writing. We encourage positive attitudes to learning a modern language and to speakers of that language, and a sympathetic approach to other cultures.This is shown through our language of the term where we look at another foreign language and make many cross curricular links with the language and the country where it is spoken. 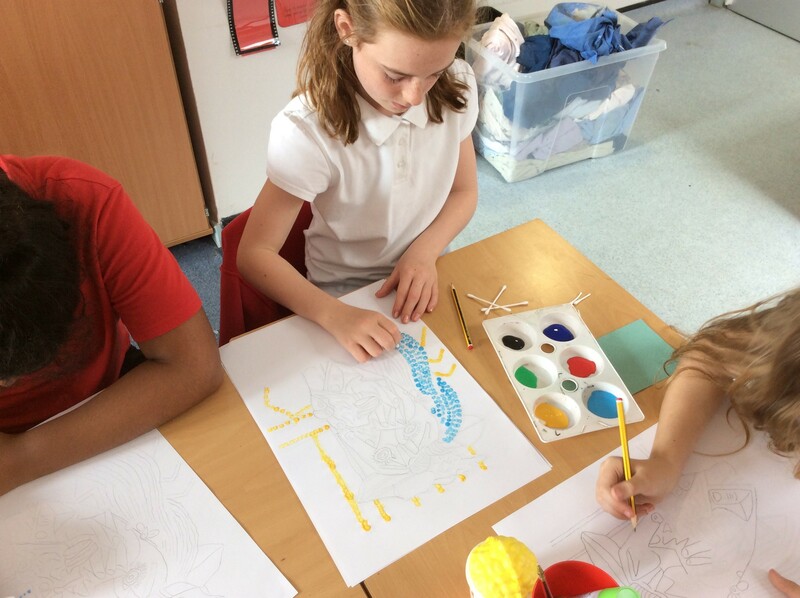 Recently, we enjoyed a variety of activities throughout the school for our Spanish day. The activities were all interactive and cross curricular. 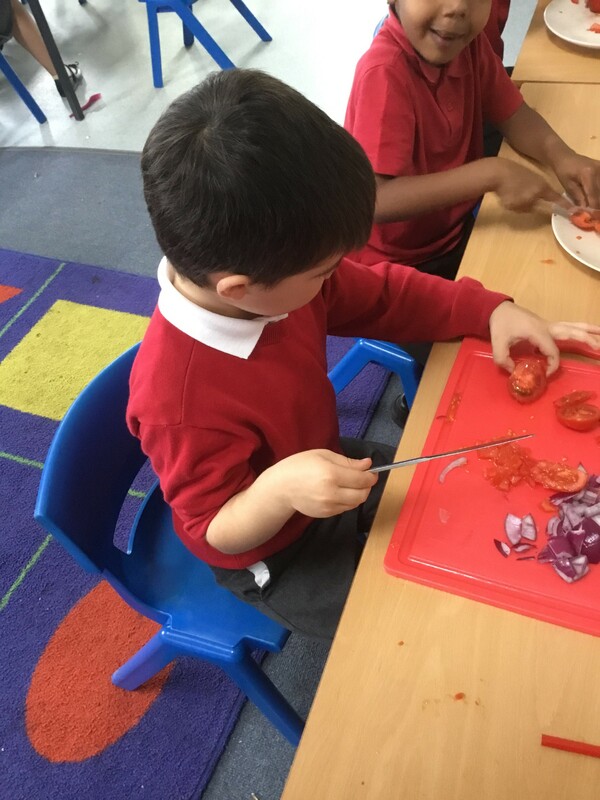 Year One enjoyed making and tasting gazpacho. Year Six used their recent mark making skills to make wonderful interpretations of Picasso’s “ Weeping Woman “ using pointillism. There are many ways you can support your child to progress in learning a foreign language, even if you don’t know a language yourself! Learn with your child. Try picking up a few words in Spanish or a language of your choice and use them in daily conversations. Practise vocabulary of everyday objects by asking your child to label items around the home in Spanish. Explore the library for books and audio books in a foreign language. Download an app. Most will enable your child to practise the use of new vocabulary by playing games, completing artwork, solving puzzles and singing. Watch episodes of familiar programmes in a foreign language or listen to a popular song in a different language. http://www.newburyparkschool.net/langofmonth/index.html – This website has a fantastic interactive computer program that contains interactive video clips showing the children of the school teaching their home languages. There are also some fantastic resources on here to download and use to support language development at home. https://agreenmouse.com/ – this website helps to make early French and Spanish listening and speaking practice available to any interested child, teacher, parent or student to use at beginner and intermediate level. http://www.bbc.co.uk/schools/primarylanguages/ – this website provides a range of activities for children to complete in Spanish, French and Mandarin.